Painful knees? You’re not alone. Half of the people in the United States have knee arthritis by the time they hit their mid-80s, including nearly 65% of those who are obese. Now a new study suggests that a type of minimally invasive knee procedure, known as arthroscopic surgery, is essentially useless for many with knee arthritis. If that sounds like bad news, it’s not—it’s good news. No one wants to undergo a pricey ($5,000 and up) procedure unnecessarily. And the study, published this week in The New England Journal of Medicine, found that relatively noninvasive treatments—physical therapy, acetaminophen (Tylenol), anti-inflammatories, and injections that fight inflammation or lubricate the joint—are effective for knee arthritis. If those stop working, patients can still go on to have a total joint replacement, which is also a very effective form of therapy, says study coauthor Brian Feagan, MD, a professor of medicine and the director of the clinical trials unit at the Robarts Research Institute at the University of Western Ontario in Canada. 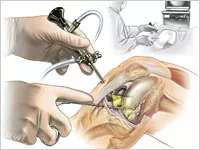 Arthroscopic surgery is used as a way station on the road to total knee replacement. When painkillers or injections stop working, surgeons sometimes try—or at least they used to try—arthroscopic surgery. During the procedure, surgical instruments are inserted through the skin via tiny incisions and used to repair damage, smooth the cartilage's surface, and remove cartilage fragments and calcium crystals. In the new study, the researchers randomly assigned 86 patients with moderate-to-severe knee arthritis to undergo arthroscopic surgery, and 86 to make do with physical therapy and medication. After two years, the surgery-treated patients had no advantages over the other group in terms of joint pain, stiffness, or health-related quality of life. That’s not to say that arthroscopic knee surgery doesn’t benefit some people with knee pain, says Frederick Azar, MD, spokesperson for the American Academy of Orthopaedic Surgeons (AAOS), who was not involved in the new study. The study did not include patients with major tears in the meniscus, which is a C-shaped disk of cartilage that cushions the knee (there are two in each knee joint). People who have knee pain due to a torn meniscus, which is more likely to occur in younger patients who hurt their knees during sports, can still benefit from arthroscopy, says Dr. Azar, of the Campbell Clinic in Memphis, Tenn.
“I worry that arthroscopy is going to get a bad name,” he says. “Hopefully it won’t, because it’s a great technology for the right patients." One type of major meniscus tear that can be fixed via arthroscopy is known as a “bucket handle” tear, says Dr. Azar. “If they tear completely in the back, they will flip over like the handle of a bucket, from the back of the knee to the front,” he says. This particular injury can prevent patients from extending their leg fully. Next page: Do you need a second opinion? However, Dr. Feagan thinks too many orthopedic surgeons are doing arthroscopic surgery on run-of-the-mill arthritis patients who don’t have these major tears. Some doctors perform arthroscopy surgery on patients who have symptoms such as “locking” or “freezing” of the joint. Dr. Feagan says his study found the minimally invasive surgery was no more helpful for those patients (who didn't have major tears) than others without knee locking. A second study in the journal found that minor meniscal tears are common—in those who have achy knees and those who don't. So that means if you have a magnetic resonance imaging (MRI) scan of the knee, the minor meniscal tears may not be the cause of the pain. So how do you know if you are a candidate for arthroscopy or not? About one million of these surgeries are performed every year, according to the AAOS, but it’s not clear exactly which patients are getting the procedures. Dr. Azar says that most surgeons have already moved away from performing the procedure for the treatment of arthritis. Dr. Feagan says there was a similar study in 2002, but many doctors continued to do arthroscopies on arthritis patients after it came out.